We’d love your help. Let us know what’s wrong with this preview of Naked In The Wind - Chemo, Hairloss and Deceit by S.A. Ledlie. To ask other readers questions about Naked In The Wind - Chemo, Hairloss and Deceit, please sign up. I loved this book-quite a different approach to a memoir of this type, but, it works really well. Shirley's memoir begins after her fight for life-she has had all the tests, diagnosis, Chemotherapy, Radiotherapy, hair loss etc. then, devastating and final, she is told her hair is never going to grow back. Maybe her reasons for not including all her experiences of her Breast Cancer are that she wanted a different memoir to all the rest where they mainly tell of the Moving, Memorable And Inspiring. This memoir is Shirley’s story of her battle with a French drug company when the combination of chemotherapy drugs she was given for her breast cancer left her with an unpleasant side effect. Having come through the cancer treatment and at a time when life should have been getting back to normal she was told some devastating news that would change her life forever. This is a very personal journey full of raw emotions, anger and pain; it is not an easy story to read, but it is one that needs to b This memoir is Shirley’s story of her battle with a French drug company when the combination of chemotherapy drugs she was given for her breast cancer left her with an unpleasant side effect. Having come through the cancer treatment and at a time when life should have been getting back to normal she was told some devastating news that would change her life forever. This is a very personal journey full of raw emotions, anger and pain; it is not an easy story to read, but it is one that needs to be told. Shirley came across as a very strong lady who stuck to her guns and stood up to the big boys when most people would have crawled into a corner and cried. She may have shed many tears, but she has also bravely bared her soul in order to tell the world the facts and risks that the drug company and experts wanted to keep hidden. Alongside the difficult times Shirley shares stories from the happier days when her family had just begun their new life in France, which were very entertaining. Naked in the Wind by Shirley Ledlie is the story of what happens after the cocktail of drugs she was given as treatment for breast cancer leaves her with permanent hair loss. I can’t even begin to imagine what that would be like but I can totally understand her quest to find a cure. Finally she realises that it’s not going to happen and seeks to find out why she is one of the few this drug has affected in this way. 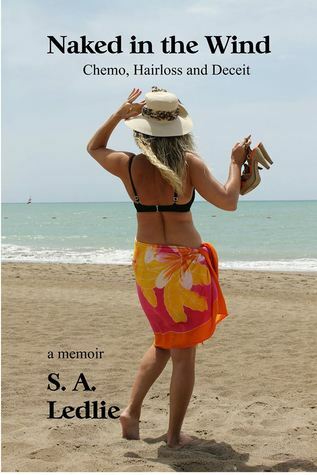 She sets up a support group and discovers that her case is not rare as she has be Naked in the Wind by Shirley Ledlie is the story of what happens after the cocktail of drugs she was given as treatment for breast cancer leaves her with permanent hair loss. I can’t even begin to imagine what that would be like but I can totally understand her quest to find a cure. Finally she realises that it’s not going to happen and seeks to find out why she is one of the few this drug has affected in this way. She sets up a support group and discovers that her case is not rare as she has been told. Her tenacity in challenging the drug company and doctors that she trusted is incredible and a lesser person would have given up. Interwoven with her pursuit of the truth is the story of her new life in France and she shares stories of the challenges she faces with her family in setting up her business. She writes from the heart and speaks honestly about her feelings of frustration and anger. In spite of everything she somehow never quite loses her sense of humour or her ability to enjoy simple pleasures and the companionship of family and friends. I found this memoir utterly compelling and I was so glad that although the fight for justice isn’t over Shirley has found an inner peace. Most highly recommended. In this amazing story, not only does the author tell her readers of her very personal fight against breast cancer, but also the effects of the cocktail of chemotherapy drugs she was prescribed to cure it. When ill, we are vulnerable, we trust those who are treating us, and Shirley was no different. However, when these people let us down not many people a brave enough to stand up against them like Shirley Ledlie. Her treatment left her with permanent hair loss, something which may have been avoide In this amazing story, not only does the author tell her readers of her very personal fight against breast cancer, but also the effects of the cocktail of chemotherapy drugs she was prescribed to cure it. When ill, we are vulnerable, we trust those who are treating us, and Shirley was no different. However, when these people let us down not many people a brave enough to stand up against them like Shirley Ledlie. Her treatment left her with permanent hair loss, something which may have been avoided if the powers that be had done their research more thoroughly. This story is hear rending at times, inspiring and honest, as she bravely chronicles her battle with French bureaucracy and a French drug company. This is an amazing story, which I read in one sitting. The author of this memoir is one brave lady who as a vulnerable cancer patient took on the big drug companies. This entailed doing battle in French at high powered meetings in Paris. I admire her spirit, humour and courage. Ledlie has a pleasing writing style, which makes easy reading. Having endured the same drugs myself during cancer treatment, I realize I had a narrow escape! Shirley is a former weekly columnist for the Bella magazine, author of three books, numerous media articles and she is never short of invitations to take part in podcast/radio interviews. Currently, Shirley is writing short fiction stories for women's mags and working on her first novel, which she's very excited about: 'it's a psychological suspense thriller inspired by a true story.' There is also Shirley is a former weekly columnist for the Bella magazine, author of three books, numerous media articles and she is never short of invitations to take part in podcast/radio interviews. Currently, Shirley is writing short fiction stories for women's mags and working on her first novel, which she's very excited about: 'it's a psychological suspense thriller inspired by a true story.' There is also a fun memoir, with a release date of June 2018. It's the first in a series of motorhome memories which focuses on her camping trips to Spain, Portugal and France where she has lived for eighteen years.